I asked my Facebook friends who have been married for at least twenty years what advice they’d give to a young, married couple, and I loved their answers! I have such wise friends. Read Part Two. Read Part Three. Read Part Four. 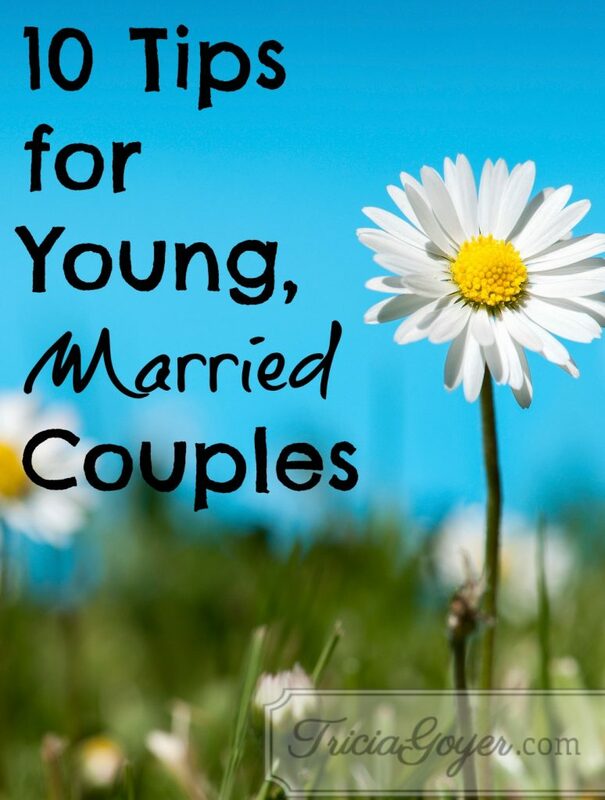 Pass on these posts to any young, married couples you know! Tips for couples. Great advice! Like these tips? Read More! I loved the comment : “Divorce is not an option” because when one finds love in the relationship and is happy, there is no reason not to try and work out any diiferences that may crop up! Its love that matters. You are so right Fawn. We never even mention the “D” word! I’m doing a whole series on my website this month on Married Love – I’m sending people to your site! This is wonderful!!! Thank you so much, Molly! You are doing the right thing by seeking advice! Saw this on Twitter, which led me to Pinterest, which led me here. Ha. Well, going on 23 years so I can tell you one thing for sure… there are bumps in the road and times when you won’t even like your spouse, but communication and prayer will get you through anything. I’m glad you found us, Michelle! 23 years is awesome! We’re the same! I’m 19 years old and I’m enagaged to the love of my life. Who I might be expecting from I’m kind of scared because I want eeverything to go right. He is younger then me by a year… anyone can help me calm my nervs? I just put a post up on my blog about 4 things that I learned in my first year of marriage. We are celebrating our first anniversary today! My husband and I are 31 and 25 respectively and i truly appreciate the pearls of wisdom that have been given to us just like in this post! Thank you for this. I love the advice: especially the suggestion to be each others’ biggest cheerleaders. I watched my parents embody this growing up and it’s something that I strive to do every day. I think validating the aspirations of your partner is one of the most vital parts of a healthy relationship. Thanks for sharing your advice with us! Hi Tricia! Very nice tips that are real and honest. I have nothing against getting professional marriage advice but when it comes from folks living it day in and day out it’s a fresh perspective. I do believe that couples need to not be so thin skinned and understand that despite what their thought was before the marriage, their is no perfect spouse. It’s also harder these days as spouses are constantly comparing their marriage to what others post of Facebook and Twitter. Just remember, everything you read on the internet is not true. Thanks for creating this site and helping couples with the awesome responsibility of marriage. whoah thiis blog is magnificent i really like reading your posts. Keepp up the good work! You understand, many people are looking round for this info, you could help them greatly.